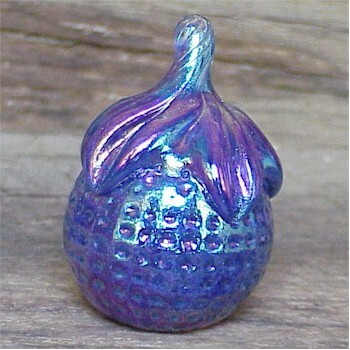 Strawberry Paperweight in Cobalt Carnival, Bargain Shack offers Boyd Glass, Mosser Glass, L.G. Wright, and Contemporary Collectible Glass including Vaseline Glass - J.B. Scottie Dogs, Pooche, Animal Covered Nests, Toothpick Holders, Salts, Glass Animal Figurines, Clowns, Dolls, Slippers, Vehicles, and More! Do you love strawberries? If you do, this paperweight is for you! Standing 3" tall this strawberry is marked Gibson on the bottom. The marking isn't clear but it was made in the year 2005. What a great reminder of the warm days of summer! Gibson doesn't make them anymore so be sure to get yours before they are sold out!